The D. Landreth Seed Co.
1780 David Landreth and family left their home near the Scottish border to establish his seed company in Montréal, Canada. 1781 Landreth seed business started in Montréal, Canada. 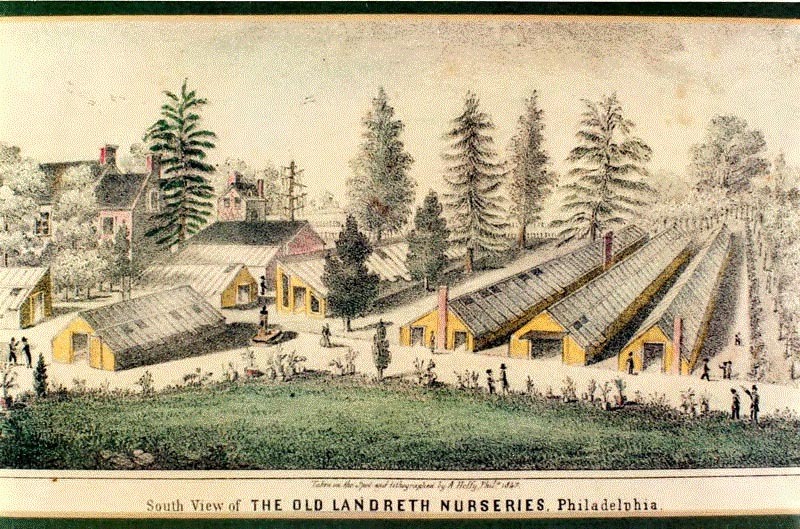 1784 David decided Canada was too cold for the nursery business so he left, settled in Philadelphia, and named his company simply, David Landreth. 1789 David Landreth was joined by his brother Cuthbert. 1790 Company name changed to David & Cuthbert Landreth. 1798 Landreth’s introduced the Zinnia from Mexico. 1808 The Osage orange growing along the Osage River was found by the Lewis and Clark expedition and sent to the Landreth Nurseries. 1810 Landreth Farm used the first horse tread machine, which was invented by a man named Robinson in order to drive grain and seed through threshers. 1811 Landreth introduced the first white potato in the United States. All the potatoes before this had a slight, yellowish tinge. 1818 David Landreth 2nd was sent to Charleston, South Carolina in order to establish a branch there. 1820 The first tomatoes were brought into the country and later the first variety of yellow tomatoes were perfected. 1822 Landreth’s Extra Early Pea was introduced. 1826 A new type of spinach was introduced by Landreth’s, which eventually developed into Bloomsdale Spinach. 1828 David Landreth and David the 2nd were among the founders of the Pennsylvania Horticultural Society. Both were officers for eight years. David Landreth II also belonged to the Philadelphia Society for Promoting Agriculture and served as its president twice. 1830 Company named changed to David Landreth & Co.
1832 David Landreth was the first person to publish the first floral and horticultural magazine in Pennsylvania. 1835 David Landreth Jr. became President of the United States Agricultural Society (remained for several years). 1843 Company became known as David Landreth & D. Landreth Munns. 1845 Company name changed back to David Landreth. 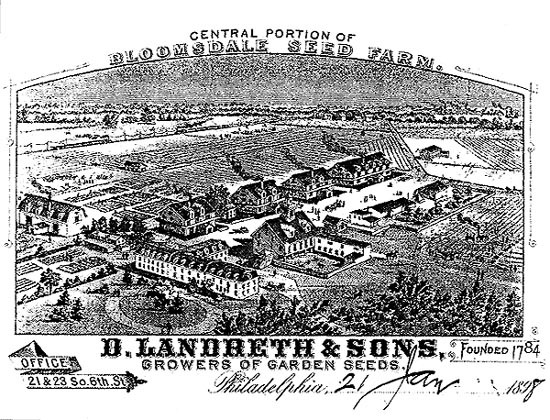 1847 Landreth’s farm moved from Philadelphia to Bloomsdale Farms in Bristol, Bucks County, Pa.
1852 Landreth’s gave Commodore Perry thousands of pounds of American vegetable seeds to take with him on his expedition to Japan. When Perry returned to the United States from Japan, he brought the first Japanese shrubs and plants ever imported into this country to the Landreth Nurseries. 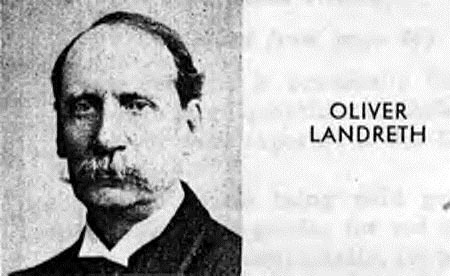 1853 Landreth’s established a machine shop in Bristol for making mowing machines, reapers, plows and corn shellers that were shipped all across the U.S.
1860 Decided to change company name to David Landreth & Son. 1862 Burnet Landreth commissioned as captain in Philadelphia City Militia Regiment. 1865 Purchased Reedland Farm in New Jersey, which is just above Burlington to raise peppers, watermelons, cantaloupes, squash and onion sets. 1868 Purchased a 5,000+ acre plantation on the Rappahannock River in Virginia to grow turnips, rutabaga, cabbage, etc. 1872 Landreth’s was the first to develop a steam-powered tractor for plowing in Pennsylvania. 1875 Name changed to David Landreth & Sons. 1876 Captain Burnet Landreth served as Chief of the Bureau of Agriculture of the Centennial International Exhibition in Philadelphia. 1880 David Landreth II passes away and reins are passed to Burnet and brothers. 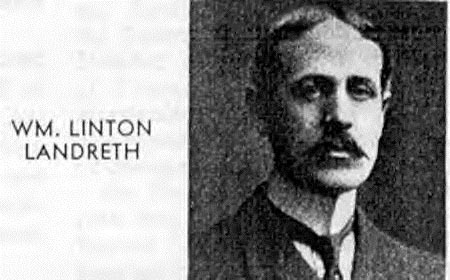 1885 William Linton Landreth, second son of Oliver, entered business and continued until he retired in 1902. 1887 Captain Burnet Landreth served as Vice President of the American Exhibition in London. 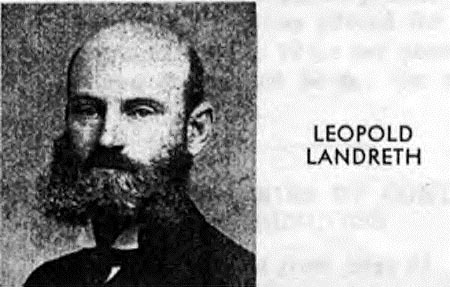 1890 Company's partners were now Oliver, Burnet and Leopold Landreth. 1897 Captain Burnet Landreth became president of the company. According to Green (1938), Burnett was called "the dean of American seed growers" and was decorated three times by the French government for his work in agriculture. 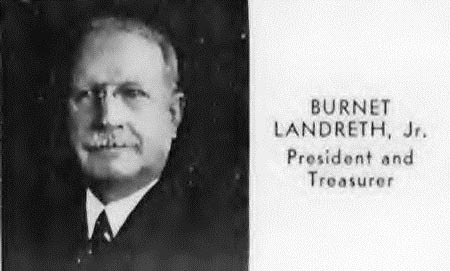 1903 Company changed its name to D. Landreth Seed Company and incorporated with Burnet as the president in 1904. 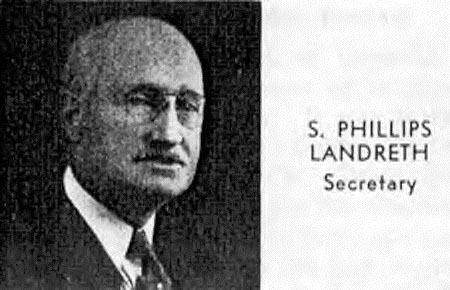 1904 Burnett Landreth Jr. and Symington Phillips Landreth (d.1931) became partners. 1906 David Landreth the 4th joined the partnership. 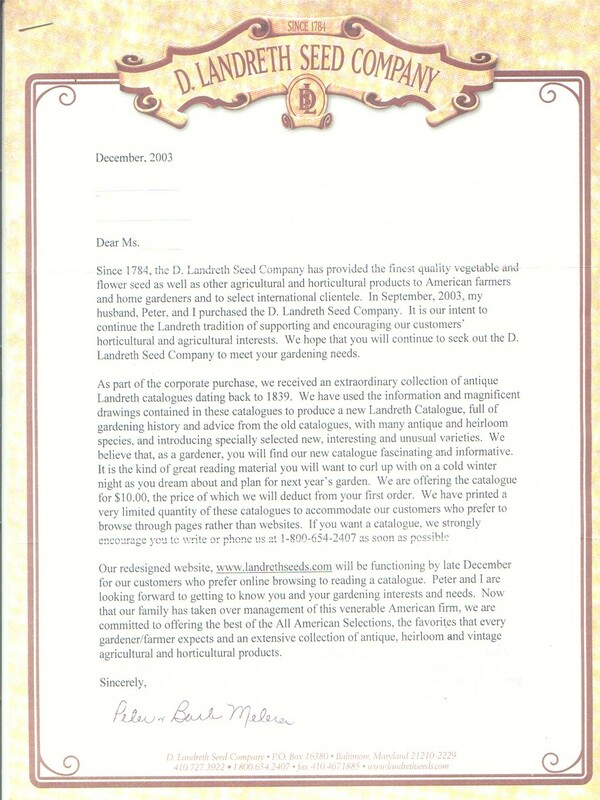 2003 From a letter sent out to past customers, the D. Landreth Seed Company name was purchased by Peter and Barbara Plantholt Melera, a professor of biochemistry and molecular biology and a venture capitalist, respectively. They have resurrected the name as a mail order seed company and marketing as the "Oldest Seed House in America." 2005 According to an interview in the Baltimore Business Journal, at the time of purchase, revenues hovered around $250,000. As of the article date, Melera said sales reached $500,000. According to Melera, even at a $500K sales level, the company still wasn't turning a profit. To date, she was feeding the company with her own money, a loan from Sun Trust and a small loan from the Baltimore Development Corporation. Jeffrey P. Pillas, CFO for the Baltimore Development Corp., said the BDC gladly gave the company a $40,000, five-year loan at a 5 percent interest rate. "Good management, nice lady who has a lot of business experience," Pillas said. "In my view, it’s well worth the risk." The company has five employees and she plans to add more. "I would like for the company not to be gigantic," she said. "But I would like to be a substantial presence in the Baltimore area as a blue-collar manufacturing house." You can find them on the web at landrethseeds.com. "Landreth, Cuthbert;" Dictionary of American Biography, Under the Auspices of the American Council of Learned Societies... New York: C. Scribner's Sons, 1928-58. "Landreth, David;" Dictionary of American Biography, Under the Auspices of the American Council of Learned Societies... New York: C. Scribner's Sons, 1928-58. History of Horticulture - Landreth, David, Jr.
"Visions of Vintage Vegetables," The Washington Post, March 20, 2004. "Seed Mailer Thrives Under New Owners," MultiChannel Merchant, January 5, 2006. "Circulation Blossoms for Seed Catalog" - DM News, March 20, 2006. "Back to nature: VC expert grows business seed by seed", Baltimore Business Journal, 2005. "Seed seller gets a second chance," by Ginny Smith, The Philadelphia Inquirer, January 16, 2010. Email correspondence with Ethan Platt, president of American Meadows, Inc., January 18, 2016.